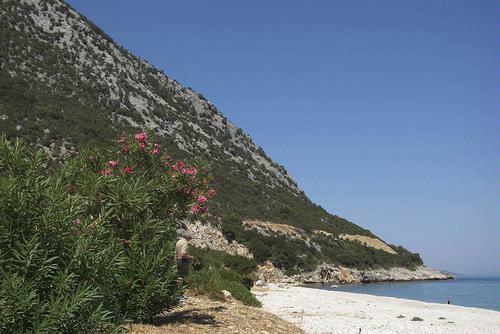 The beach at Poros is backed by steep mountains. Situated on the south-east coast of Kefalonia lies the town of Poros. The town is in three distinct parts; the first being the main town with its banks, post office, shops restaurants bars and tavernas. It is separated from the second part which is the beach area by the Vohinas river. It has a huge sand and shingle beach and huge promenade backed by restaurants and tavernas. Thirdly is the port and marina area. Ferries cross daily from Poros to Kylinni and Patras on the Peloponnese region of mainland Greece. Within a short distance of Poros, the main road out of town enters the Poros Gorge which is very impressive. The gorge is about 80 metres deep. Legend has it that the gorge was created by Hercules when he is supposed to have stood on and flattened the mountain. A short distance from the gorge can be found the Tombs of Tzanata which were discovered in 1991. Many artifacts and gold jewelry were found. It is thought the tombs date from 1400 - 1050 BC.